The good news? Part 2 is more of a story than an explanation. The bad news? More spreadsheets. But before I go on, I want to clarify something… You may have noticed the word “hate” in the title of this series, but noticed a distinct lack of loathing in my protracted breakdown of car research. You might have even thought, “Man, I dunno, he kinda seems like he’s in his element here… It kinda sounds like he… likes doing this.” Well, let me put it as simply and plainly as I can: I hate the fact that, in order to feel like I can make a truly well-informed car-buying decision, I have to spend that much time gathering data and info (in fact, it would actually be great if there was a site that aggregated all of it in to one place for me). And you might counter by saying “You know, you don’t really have to spend that much time on it. I mean, many people do what they consider to be an adequate amount of research and don’t come close to what you’re doing.” While that may be true, I have this hang-up where satisfaction is only registered at extremely high levels of precision, detail, and thoroughness. Cue the Stones. Once we had narrowed our search to 2009-2010 RAV4s and CR-Vs, it was time to find out what was available in our area. I’m not really keen on the whole long-distance car purchase concept (via eBay or any other site), and I didn’t really want to mess with the pitfalls of a private party sale. Plus, I was really wanting a manufacturer-certified vehicle for the warranty, so I focused on dealership vehicles. Cars.com was my favorite site for this, as they seem to have the most complete and up-to-date listings. 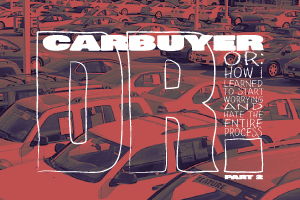 Although cargurus.com has the added bonus of listing an “Instant Market Value” for each vehicle (more on that later), it doesn’t list the actual dealer selling the vehicle, so you have to compare VINs/stock #s to know what vehicle you’re looking at. 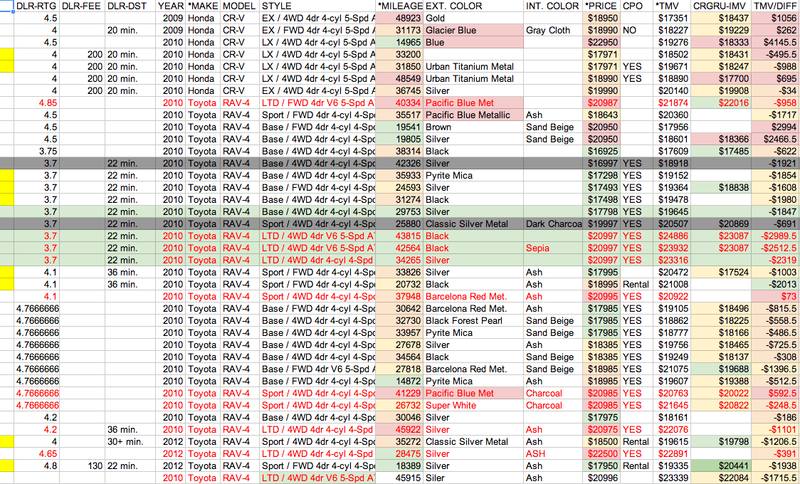 After plugging in the info for all of the listed vehicles, I color-coded again in ranges of green-for-best to red-for-worst (some areas have been re-colored or had data changed in the screenshot above, so the labeling may not be completely accurate). This is really just for my own visual reference, so that I can identity the best options at a glance. Once I had identified the best options, it was just a matter of determining which ones to go look at first. I had noticed that CR-Vs were in much shorter supply than RAV4s, and that only one Honda dealer in town had a selection of certified CR-Vs that fit the bill for us. So we figured we ought to start there, in case we really liked a specific CR-V and didn’t want to lose it. I had already contacted the dealership about a couple of the LX models, just to get all the vehicle info and a price quote, including whatever fees they charged. The internet sales… guy… had asked me to let him know when we might come by, but we dropped in unannounced. This became a theme, consequently. After taking a look at the LX models, he showed us some of the EX models, which are the “fully-loaded” trim. I don’t know if I can defend or rationalize it, but my wife and I have always had a thing for sunroofs (I think because we both had them on previous cars), so the EX models were immediately more appealing (albeit – and obviously – more expensive). As we looked at them, though, we weren’t really loving the vehicles in general. They were fine – nothing bad about them, per se – but I think they seemed a little smaller than we were expecting, and the colors that the dealership had on the lot weren’t really selling them, either (do people buy “Glacier Blue” and “Opal Sage” ?). Our ho-hum reaction to the lack of desirable colors in a vehicle with a sunroof (I don’t think we actually voiced this – he just zeroed in on it) led him to dig into his phone for the CR-Vs they had on order that had yet to arrive. We stood there while he scrolled through the list: “Here’s a black 2008, but it’s an LX… Here’s an EX – doesn’t list a color, though… Looks like we’re getting a silver EX, but it’s got over 65,000 miles on it, so…”. Finally, he spotted one that seemed promising, but since it hadn’t been delivered to them yet, all he could do was promise to let me know when it came in. We thanked him and headed home. After being underwhelmed by the CR-Vs (whether it was the selection, or the vehicle itself – it’s hard to tell), we decided to go check out some RAV4s. Since one specific Toyota dealer had a handful of RAV4s that fit all our criteria, we figured that was as good a place as any to start. For the sake of keeping dealerships straight, and to avoid using their actual company names, I’ll just call this dealership Big Burbs Toyota. Again, I had already been in touch with their internet sales manager (I’ll call him Anthony) to get info on a few of their base models, and although he had asked for a heads up when we might be coming by, we again dropped in unannounced. I immediately felt guilty about this when the salesman that greeted us told us Anthony had left for the day just minutes earlier. Oh well, let’s look at some cars, right? Now, that may seem pretty close, until you think about the fact that the 4.4 cubic feet of difference in passenger volume equates to about 33 one-gallon milk jugs. So not only does the RAV4 have plenty of room for everyone to pile six and a half gallons of Vitamin D on their lap, it’s also got the CR-V beat by about 5 more jugs of 2% in the back. That’s a lot more milk. I can’t really contrast/compare the performance/handling of the two vehicles, since we didn’t even drive a CR-V. But suffice it to say that my wife liked driving the RAV4, and I couldn’t stop thinking about all that extra milk, so the CR-V went quietly into the night, and we zeroed in on our RAV4 options. MISTAKE ALERT: And while this is the first time I’m pointing this out, it’s actually the second time it happened… Remember when I let the Honda salesman steer us from the LX to the luxury EX trim line? Well I did it again at the Toyota dealer. I asked if any of their base models happened to have a sunroof installed, and no sooner had he said “Nope, but…”, we found ourselves peering around the interior of a 2010 RAV4 Limited – a vehicle I had already decided was out of our price range. So what’s the lesson to learn here? If you can’t afford the “Limited”, don’t look at the “Limited”! This is what the comparison looked like in my head. I mean, which one would you want? Now we were left with a predicament. Were all these bells & whistles worth going over our budgeted amount? When you added up the smart keyless entry, heated leather power-adjust seats, steering wheel audio controls, power sunroof, auto-dual-climate control, “premium” JBL sound with subwoofer, and the little fancy lights on the side-view mirrors… was it worth an extra $4000? My answer proved to be a relatively naive one. But Part 2 ends here, so you’ll have to come back for Part 3 // Buying if you want to know what happens (and, to be honest, it should be best part).